Bellevue (/ˈbɛlvjuː/ US dict: bĕl′·vyū) is a city in the Eastside region of King County, Washington, United States, across Lake Washington from Seattle. 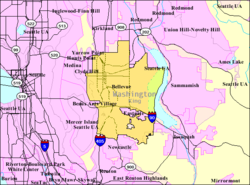 As Seattle’s largest suburb, Bellevue has variously been characterized as an edge city, a boomburb, or satellite city. The city had a population of 122,363 at the 2010 census. Prior to 2008, downtown Bellevue underwent rapid change, with many high rise projects under construction, and was relatively unaffected by the economic downturn. It is currently the second largest city center in Washington state with over 35,000 employees and 5,000 residents. Based on per capita income, Bellevue is the 6th wealthiest of 522 communities in the state of Washington. In 2008, Bellevue was named number 1 in CNNMoney‘s list of the best places to live and launch a business, and in 2010 was again ranked as the 4th best place to live in America. The name “Bellevue” is French for “beautiful view”. In 2014, Bellevue was ranked as the 2nd best place to live by USA Today.